I have recently had the inclination to evaluate Free Software groupware solutions in more detail, and perhaps the first that came to mind was Kolab: a long-running project that provides a range of groupware functions including e-mail, calendaring, address books, task management, and various other functions for a fairly wide range of organisation sizes. Of course, there are plenty of Free Software groupware projects offering complete and integrated solutions as well as individual components for use with existing infrastructure; the Debian Wiki page on groupware provides a fair (but probably incomplete) overview of the more interesting projects. 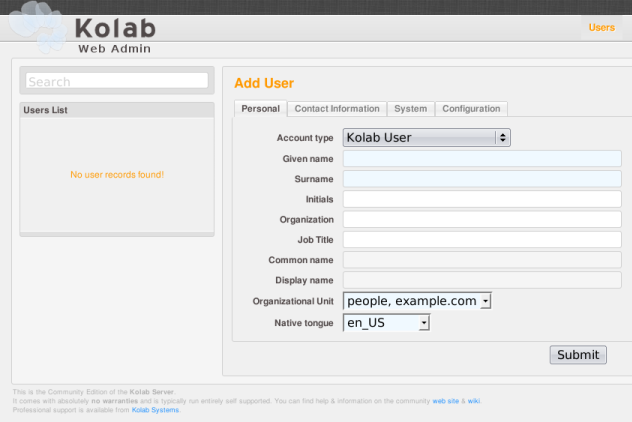 Intrigued by accounts that Kolab is fairly easy to install on Debian Wheezy – the latest stable release of the Debian GNU/Linux software distribution – I set out to investigate, making use of my own tools to set up a User Mode Linux environment in which I could install the software. Initially, I tried to re-use an existing virtual environment, but a quick attempt to configure the software using the setup-kolab program was not successful, and a brief excursion via the #kolab IRC channel (on freenode), indicated that I might be better off starting with a completely fresh installation of Wheezy. 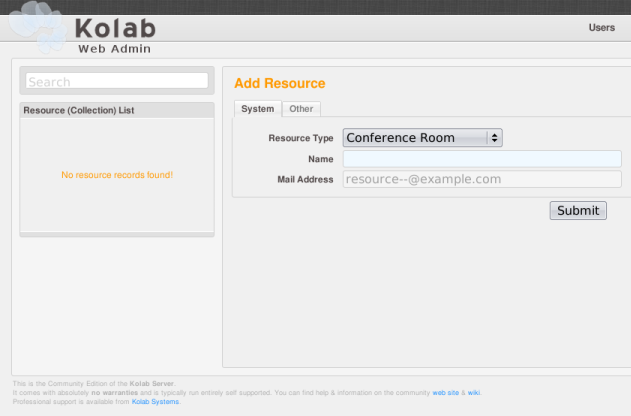 Although I imagine it is possible to deal with the problems I encountered – setup-kolab did not like the presence of an existing LDAP server – the easiest way to troubleshoot is to start with a known configuration and see if things can be made to work from there. Installation of Kolab 3.0 on Debian is fairly straightforward, as described both in the manual and more concisely in the blog article mentioned above (and also in older reports). The Kolab packages in Debian are set up to prefer the postfix packages to the apparent default of the exim4 packages and thus want to replace the latter. This might be a problem in some environments, and it may be possible to retain Exim for use with Kolab, but I haven’t investigated this. A somewhat undesirable feature of the currently available packages is that they are unsigned: Debian makes extensive use of package signatures to prevent tampering, and although it can be an annoyance to sign and publish packages and to publish the necessary keys for verification, hopefully Kolab will make its way into Debian as a collection of official packages once again. I noticed that no matter which resource type I specified, the type of created resources would always be “Beamer”. This probably doesn’t matter so much for actual resource booking, but I imagine that there’s a problem here needing to be fixed. It is possible that the Debian packages suffer from the above problems but that these problems have since been fixed in the project’s repository and in subsequent non-Debian package or distribution releases; I haven’t verified this, however. 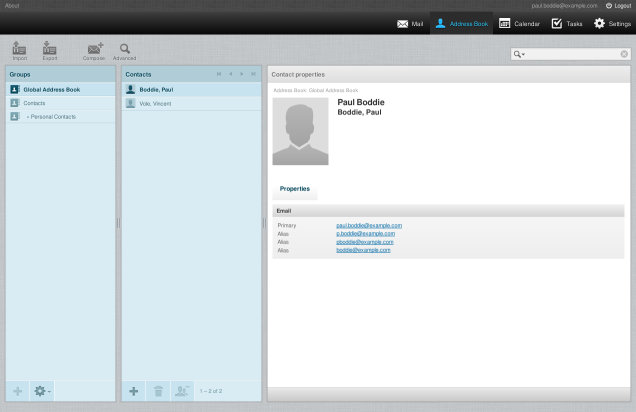 Administration is never really much fun, but the administrative interface seems to provide a reasonable way of adding users and resources, populating the different information stores with user and mailbox details. 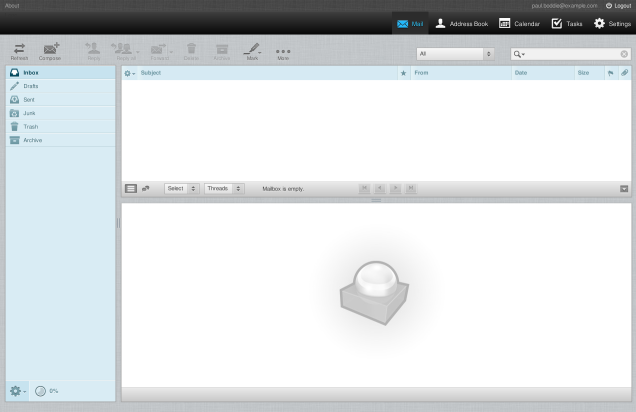 Given that Kolab is based on conventional services like LDAP directories, IMAP mailboxes, and so on, if you needed to integrate with existing infrastructure and accommodate existing user populations, you probably wouldn’t spend much time in the administrative interface, but it is nice to see that an interface exists for quick edits to the system. Just like the mail interface in Roundcube, the calendar also supports address lookups and offers autocompletion of names. However, I found that autocompletion didn’t take place for resources, so I ended up having to invite resources by using their full e-mail addresses (which were defined previously in the administrative interface). 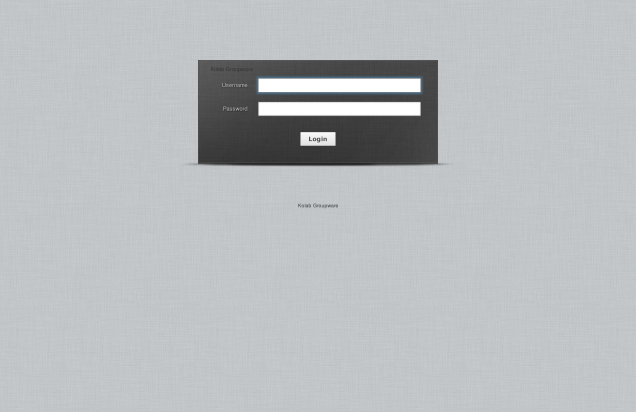 For example, for the “Forest” resource, I had to specify resource--forest@example.com as a participant. Maybe this is also something that should be done another way, but I didn’t manage to figure it out. 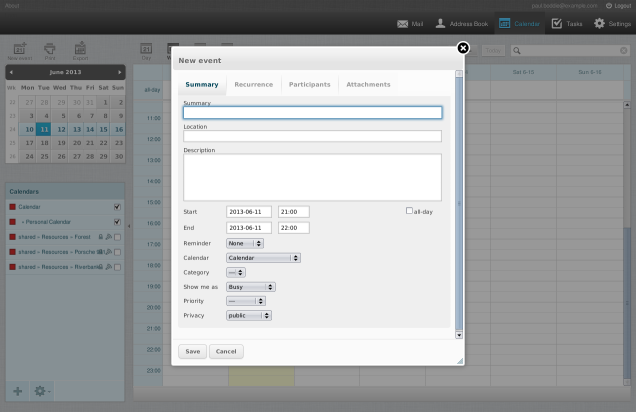 In principle, it should be possible for people to exchange free/busy information via e-mail and for the recipient to record this information and use it to schedule events, but I haven’t looked into whether Kolab or Roundcube support this at their respective levels. I found that in the availability view, it is possible to change the role of each participant by clicking on the icon next to their name, and this made it possible to give a resource the appropriate role. Again, if there were a better way of choosing a resource that I missed, maybe this wouldn’t be necessary. For Kontact to be able to do this, it appears that the kdepim-groupware package is required, and indeed this functionality supports the iTIP technology mentioned above (here, in an invitation context instead of the free/busy context discussed above). 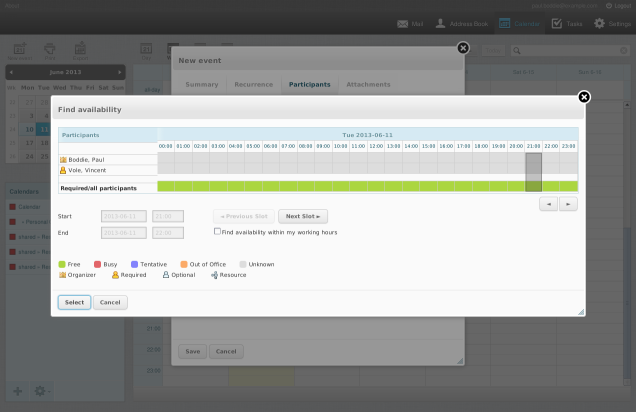 It is important to understand that the open standards underpinning this workflow do not require that everyone have a login to a common server and manipulate information on that server directly: a critical feature of the iCalendar-related standards is that people are able to schedule events collaboratively without all being part of the same monolithic organisation and/or infrastructure. 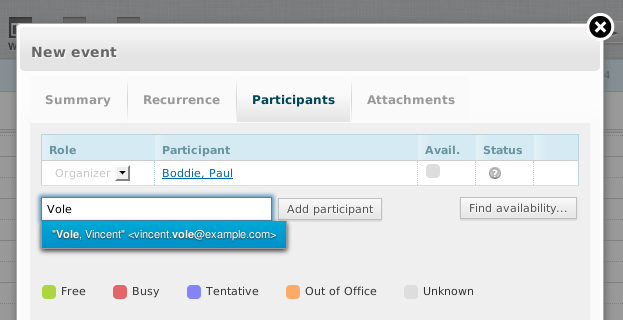 It is also interesting to see that where a recipient’s e-mail program cannot handle the workflow defined by iTIP, the message includes a link to the Roundcube webmail that can be used to signal a participant’s attendance or absence. 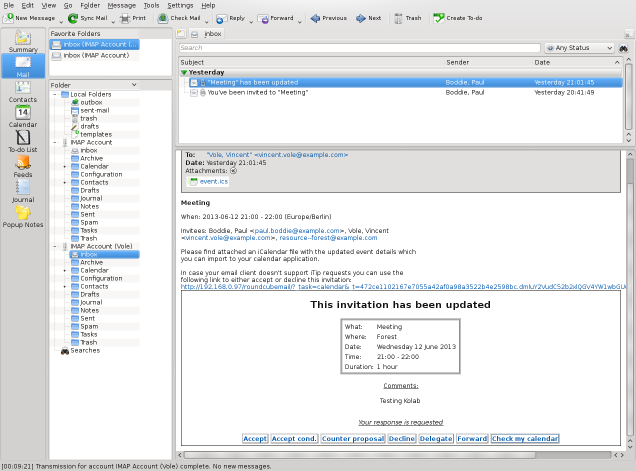 Here, the organiser is shown with a crown next to his name, the participant (using Kontact) has accepted the invitation to the event, and the resource has apparently been secured. There are obviously plenty of other experiments that could be performed here, as well as other features that could be explored. For instance, some more evaluation of the free/busy information, how local and remote users interact with it, and how well those with non-iTIP mail clients fare with over-the-Web notification of attendance or absence might be in order. Publishing calendars for over-the-Web consumption is also apparently supported, and it might be interesting to see how well Kolab supports the general “invite people you hardly know” event-planning paradigm that the likes of Doodle have been attempting to popularise. It seems that Kolab at the very least supports basic calendar functionality in association with standards-compatible clients, and perhaps a brief investigation with Thunderbird (plus Lightning) and even more elementary mail and calendar clients might be informative. Since Kolab is Free Software, of course, the chances of resolving any shortcomings are increased for those willing and able to peruse and modify the code, and maybe I will take a closer look at that, too. 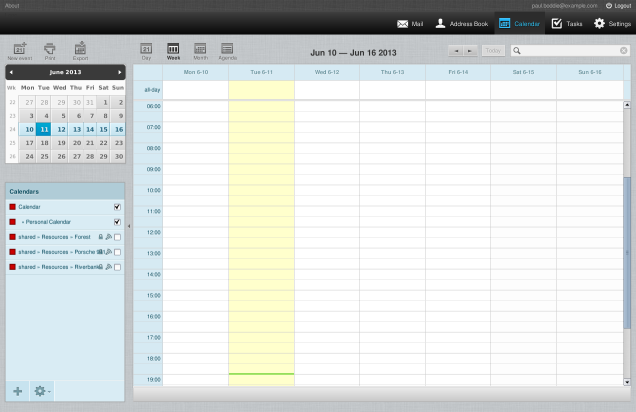 As noted above, calendaring and scheduling systems are already an interest of mine. The only problem now is that there’s just so much to look at and yet so little time to do so! 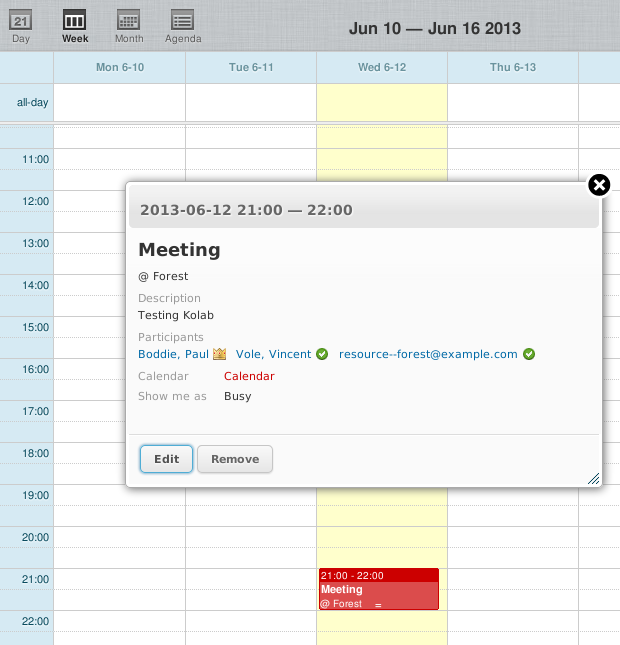 This entry was posted on Thursday, June 13th, 2013 at 4:48 pm	and is filed under calendar, English, Free Software, groupware, Kolab. You can follow any responses to this entry through the RSS 2.0 feed. Both comments and pings are currently closed.